Holograms and printing with custom Hologram ribbon. Holography dates back to 1947, when British/Hungarian scientist Dennis Gabor developed the theory of holography while he was working on improving the resolution of an electron microscope. Dennis Gabor coined the term hologram from the Greek words "holos" (meaning 'whole') and gramma (meaning 'message'). 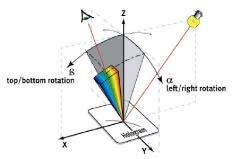 The development of laser technology in 1960 made holography commonplace. A hologram is a three-dimensional image, created with photographic projection. Unlike 3D or virtual reality on a two-dimensional computer display, a hologram is a truly three-dimensional and free-standing image that does not simulate spatial depth or require a special viewing device. Holography dates back to 1947, when British/Hungarian scientist Dennis Gabor developed the theory of holography while he was working on improving the resolution of an electron microscope. Dennis Gabor coined the term hologram from the Greek words "holos" (meaning 'whole') and gramma (meaning 'message'). The development of laser technology in 1960 made holography a reality. Why use a hologram as a security feature? 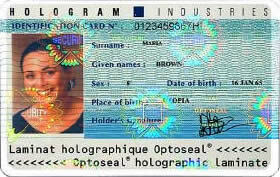 A hologram is impossible to duplicate with a scanner or a colour copier. It is not possible to imitate with standard printing technologies. The primary visual security features can be used to integrate second or third level control features. InteractCard produce custom hologram ribbons, contact us for more information.